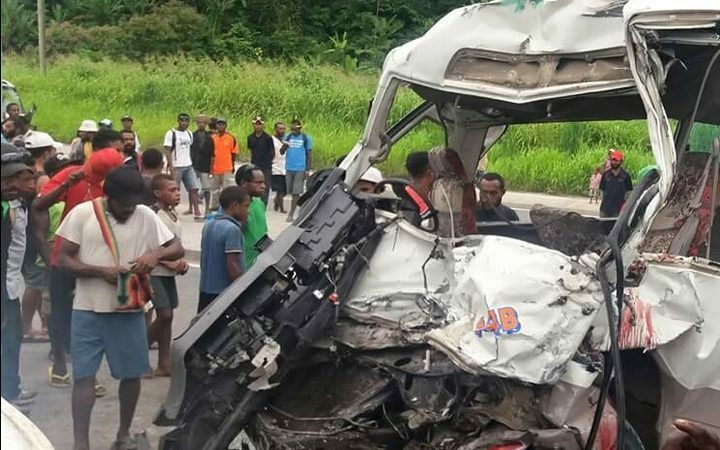 At least 10 people have been killed and dozens hospitalised in two separate accidents on Papua New Guinea's Highlands Highway.Eight people died when a public motor vehicle - a small bus - was involved in a head on crash with a truck. A second accident near Goroka in Eastern Highlands claimed two more lives. Another four people were admitted to intensive care after the crashes. In the past two months 17 people have died in crashes on the Highlands Highway. The accidents come amid increasing concern over the state of the key road, the main highway serving the country's highlands region. But PNG road safety manager Wilson Wariaka said the accidents were almost always the drivers who were at fault. "Human behaviour is the key factor. Research all around the world has confirmed it. i think more than 90 percent of the accidents that happen are related to human behaviour. So the remaining ten percent is to do with vehicle problem or road conditions."